The summer sun is high in the sky. As the temperatures soar, Mother Nature decides to hold back on rain. Your grass, garden, and trees are beginning to suffer. Below are a few tips for keeping your green space green throughout the summer. Did you know that unmulched soil can lose up to twice as much water as mulched soil, due to evaporation? Three to four inches of mulch around your plants will not only reduce soil temperature and keep moisture in the soil, but it will help to smother those pesky weeds that want to steal any available water. As a bonus, organic mulch will break down in the soil building up its organic content and preventing compaction. That gives your soil a better chance to soak up water for your plants use. When mulching around trees, pull the mulch back a bit around the trunk to allow air to reach it. It is best to water in the morning when the humidity is high and the temperature is cooler. Less water is lost to evaporation this way, and it prepares your plants and lawn to face the hottest part of the day without wilting. In the heat of the day, water evaporates faster causing you to use more water to get the job done. Also, water droplets on the plants work like a magnifying glass for the sun and could cause “sunburn” on the leaves. Watering too late in the day doesn’t give the plants time to dry properly and could promote fungus growth. 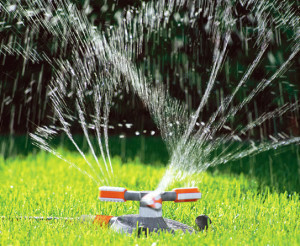 Since shade is so important in keeping down the temperature of your lawn, don’t forget to water your trees. To help the water reach deeply to the roots, drill holes 24 to 30 inches deep around the base of the tree and fill them with compost. Water your lawn and trees slowly to help the soil absorb the water. This will also help to prevent water loss through transpiration which is a way that grass and plants “sweat” through their leaves. Finally, be mindful to deal with pests that will sap your precious plants and lawn of their strength. Plants use about one inch of water from the soil per week of the growing season. Use a rain gauge to estimate your watering and listen to the weather forecast to decide when to water. A soaker hose will help allow the water to soak in slowly without runoff. Allowing your lawn to grow taller will help retain moisture by preventing water loss through transpiration. Consider directing the downspouts from your gutters to flow toward your trees or shrubs. Or even better, collect rainwater that flows from your roof into a barrel to use on a not so rainy day. Keeping these tips in mind will help your plants, lawn, and trees stay a healthy green all summer. 1. Rake – Remove all of the dead weeds and grass, sticks, litter, and leaves. 2. Sharpen Blade – Keep your lawnmower blade sharp. A dull blade tears and bruises the grass, therefore weakening it. 3. 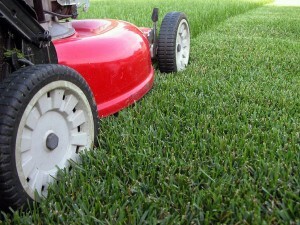 Proper Height – Generally, a lawn should be mowed by cutting off 1/3 of the blade. This may mean making two passes if the grass is especially long. Cutting a lawn too short allows accelerated weed growth and scalping causes uneven growth and bare spots. 4. Direction – Mix it up by cutting the grass in a different direction each time. This helps to prevent the grass blades from leaning in one direction. When turning the mower make turns as smooth as possible. 5. Don’t Mow Wet – Let the grass dry before mowing. Even the morning dew makes the lawn too wet to mow. Besides causing uneven cuts, mowing wet grass can encourage the growth of fungus. Wet grass clumps up under the mower’s deck. This can impede the blade and tax the engine. Also, there is danger to the operator trying to maneuver on a wet lawn. Don’t be a hero; let the ump call the game. Ideal for parking the family bikes and storing other outdoor toys like baseball bats and gloves, Frisbees, etc. There are many more ways you can use a backyard or lawn and garden shed. Your imagination is the limit. 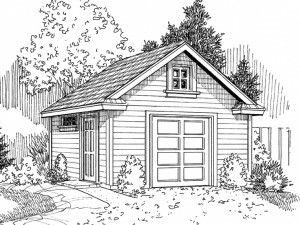 If you’d like to view backyard shed plans, please visit The Garage Plan Shop’s outstanding collection of storage shed designs. 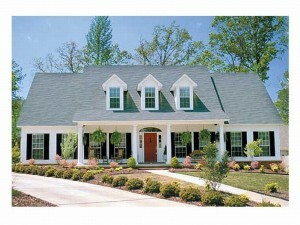 You don’t have to own a money tree or take a month off work to spruce up your home and add some curb appeal. With a little imagination and creativity and a willingness to have fun, these DIY projects will give your home an inviting look and maybe even boost your property value. Give the front door a fresh look. With a fresh coat of paint, your home will make a statement to the passers-by on the street. Bright red or a bold hue of blue will give classic Colonial and Cape Cod homes, as well as other styles, a striking look. Likewise, a good cleaning and a fresh coat of varnish will give natural wooden doors an elegant look. Remodel your porch. Adding a new porch or remodeling the one you have is like giving your home a facelift. A small porch will accentuate the entry while a full-length porch or wrap-around porch will transform the look of your home and add outdoor living space. Enhance your walkways. Be adventurous and try something other than traditional gray concrete walkways. There are all kinds of interesting pavers and stepping stones available at home improvement stores and landscaping centers. Build a walkway with bricks or paving stones and add a touch of enchantment and charm to your home. Add a little life. Dress up your walkways, porch and entry with flowers and plants. Simple touches such as hanging flower baskets or ferns on the front porch, window boxes, potted plants on the steps, or a Japanese maple along the sidewalk can make the most ordinary home stand out in any neighborhood. Add accent lighting. There are a variety of lighting fixtures that will dramatize your home from dusk to dawn, including solar power lighting. Add carriage lamps by the garage, decorative lighting on the covered front porch or landscape lighting along the driveway and walkways. You’ll give your home curb appeal from the dark street and increase safety. By tackling just one or all of these curb appeal enhances, you’ll make your home stand out in the neighborhood and deliver a welcoming look to all who enter. While you might have found the perfect house plan and built your dream home, you may not be quite sure of how to make use of your backyard. One thing is certain, if you love being outside, you’ll want an outdoor room. Below is a list of tips from The House Plan Shop to help you come up with an outdoor living space that is right for you. 1. Divide your space – If you have a large backyard or even a small one, it is important to divide your space. Determine where you want your outdoor room, what portion of the yard will be for the kids to play and the dog to roam, and where do you plan to have a vegetable or flower garden. 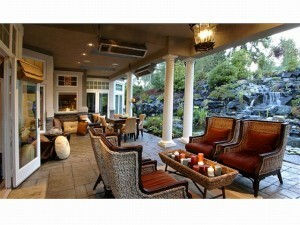 (Keep in mind your outdoor room does not necessarily have to be the back porch, deck or patio.) Use archways, hedges, fences, gates and shrubbery to define each of the necessary spaces within your backyard. 2. Consider an outdoor room with a view – Be creative. Your outdoor room does not need to be connected to the home or situated next to the back wall. Try positioning your outdoor room away from the house by building an open-air gazebo or constructing a pergola on a concrete slab. If it is next to the house, orient the living space to the view whether it is the deck looking over the lake or pool or a patio with a view of the golf course. 3. Dress up your space – Trim your outdoor room with lush plantings such as hostas, evergreens and colorful perennials. Add hanging ferns and container plantings of greenery and flowers to your porch, deck, patio and lanai for more visual appeal. Container plantings are easy to water and move making it easy to spread color throughout your outdoor room. 4. Add furniture and seating – Make your outdoor room comfortable and inviting by incorporating weatherproof outdoor furnishings and accessories. Anchor the space with an outdoor area rug. Add weatherproof wicker furniture outfitted with thick cushions covered with outdoor fabrics crated to withstand the extremes of the elements including mildew, fading, stains and rot. Choose water-repellent fabric that can sustain freezing conditions. 5. Consider lighting, privacy and noise – Add privacy to your room and block the view of neighbors’ wandering eyes by adding decorative, folding metal screens. Control sunlight and privacy with bamboo blinds hung from your covered porch, patio or gazebo. These versatile blinds can be raised or lowered to block sun and views. They also help control the noise of your outdoor gatherings as not to disturb the neighbors. Consider installing a soothing water fountain to screen the noise from the street and busy subdivisions. An added bonus: water fountains contribute to a soothing and relaxing atmosphere to your outdoor room. 6. Build for entertaining – If you plan to entertain in your outdoor room, make sure it is built and furnished for entertaining. Add an outdoor kitchen and bar. This can include everything from a grill or built-in stovetop to a sink, mini-fridge and wine rack. A fully functional kitchen helps keep everyone and everything outside while you are entertaining. There is no need to run in and out of the house as you prepare a meal. With an outdoor cooking station, you can visit with guests, enjoy pleasant weather and prepare a hassle free meal. Consider adding counter with bar stools for snacking and conversation. Create an outdoor dining room beneath your covered porch with a patio table and chairs. Hang a chandelier or lighted ceiling fan above to anchor the space. If you like dining alfresco, make sure you are ready to do so with a group. Include versatile furniture such as benches that can be covered with a cushion and used for extra seating or remove the cushion and use the bench for an extra table when company arrives. 7. Other elements – Don’t forget to incorporate the things you love. If you’ve always wanted a hot tub, choose a space for it. If your family enjoys sitting by the fire, add an outdoor fireplace or fire pit, perfect for gathering and conversation on a crisp fall evening. If you want a backyard pool, create a sidewalk or pathway connecting your outdoor living area to the pool. If you’re planning to create an outdoor room, carefully consider these ideas and formulate the best plan that will accommodate your family’s needs and wishes.